REMEMBER THE EARLY noughties? Remember how crazy Ireland was in the boom years? 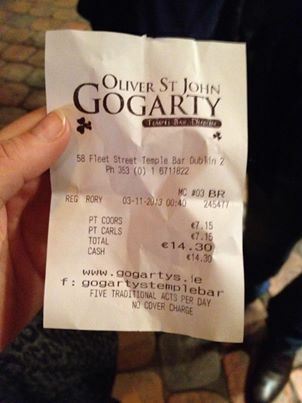 Well, in Oliver St John Gogarty’s of Temple Bar anyway. And that’s OK, apparently: a staff member told the Irish Independent that people “rarely complain” about the prices. OK, not many of us. But still. Tea capsules? Really? Currently €7.29 on Viking’s Irish site for a pack of 16. That’s 45c a cup. Yep, this is happening. Anyone remember how it ended last time? Putting the price up makes it more exclusive, see? Wine wine wine. The Government has chucked an extra €1.50 onto the price of every bottle of wine in Ireland over the last two Budgets, and it’s barely dented our appetite for the stuff. Basically, we are all now this guy in the photo. We’re probably the reason for the global wine shortage. The factory where Superquinn sausages are made has had to employ 12 new people because demand has gone up so much. Whatever happened to Denny’s, guys? What’s this? Oh, just Bill Clinton hanging with Bono and Rory McIlroy in Dublin last month. And just look at the jacket on Rory. Did he borrow that from the 2003 Gerald Kean Collection or what? *May be a slight exaggeration. But Johnny Depp was in Westmeath! To Americans, who’ll pay €49 for a bale of briquettes. God love them. Have you seen any signs of NOTIONS appearing in Ireland? Let us know – this menace must be stopped. Email “9 worrying signs that Ireland has developed 'notions'”. Feedback on “9 worrying signs that Ireland has developed 'notions'”.